← Moisture and Mask Month! Your goal is to always have luminous, glowing skin without feeling like you are wearing heavy makeup that is caked on. The days of old, cakey, orange makeup are gone. If you are afraid, fear not! The new foundations that are available will brighten up your look! Foundations have improved over the years to provide a flawless airbrush quality without the airbrush price. Current foundations have a very fine milled texture, which allows the foundation to lay very close to the skin. This gives you a fresh, smooth canvas without emphasizing lines and wrinkles. Most foundations are translucent in nature, allowing your natural skin color to glow through. This avoids the “mask affect” of thick and caked on makeup. Besides the smooth canvas that foundation creates for your face, the added benefit of wearing it daily is that it provides an extra barrier between your skin and the elements. I previously wrote about the need for that barrier here. Check it out for a refresher. Foundation should always be worn over a sunscreen. While it is true that a lot of products on the market have SPF in them, you definitely shouldn’t rely on the SPF in the foundation alone to give you the protection you need. The percentage of sunscreen that makes up the foundation is not adequate for reliable coverage. 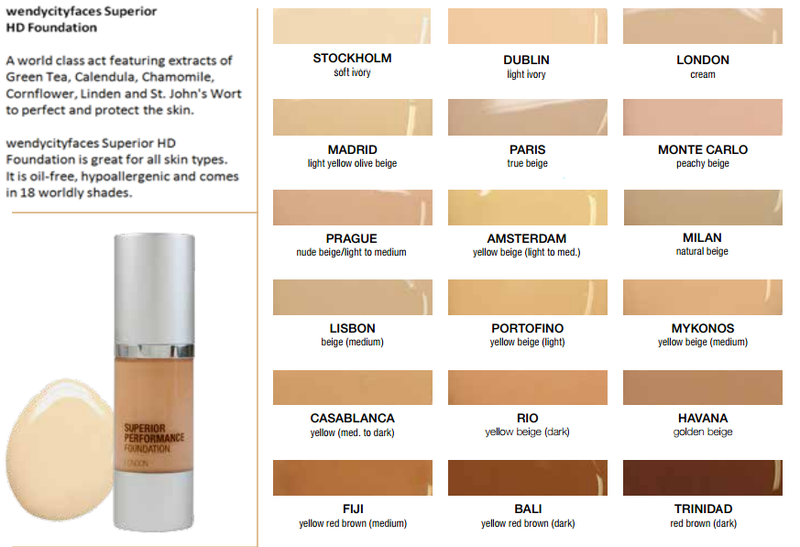 Furthermore, most foundations have a Sun Protection Factor of 15 or 20. You should be wearing an SPF 30 or above every day to protect against skin damaging rays. For individuals who have rosacia or extremely sensitive skin, you should use sun block as opposed to sunscreen. The physical block made from titanium dioxide truly blocks all harmful rays and will keep your skin protected from damaging rays and looking younger. Foundation Choices… You Have Options! The right foundation will create an even tone and brighten your face making you look radiant and alive. Foundations can be formulated to correct any yellow or blue tones in your skin, and minimize occasional or chronic redness. How do you pick your color? Come on in to wendycityfaces and let me color match you and make sure you’re getting the best color that will neutralize all the red and blue tones on your face for the best possible luminous you. 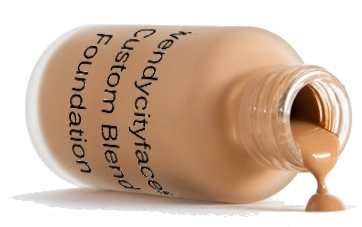 One foundation that is excellent for all skin types is wendycityfaces Superior HD Foundation. It comes in 18 colors, and is lightweight, oil free, and loaded with great antioxidants. Another favorite is Luxe from Glo Minerals. 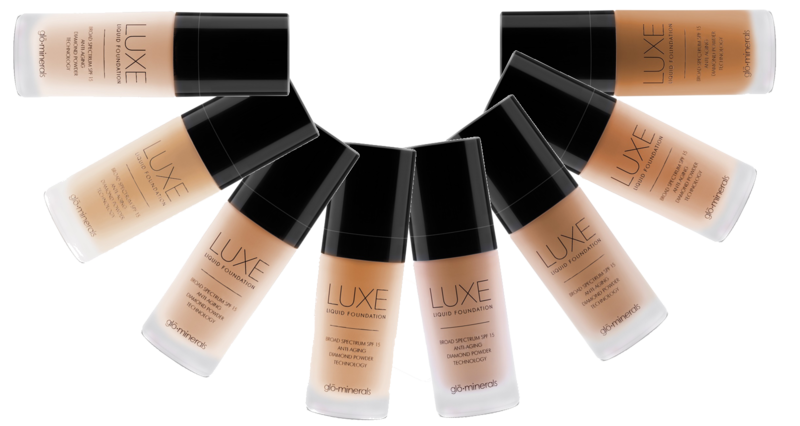 It is also a HD product that provides lightweight smooth coverage. One benefit of this foundation is that it has diamond powder, which will give a nice reflective luminous quality to your skin. Both of these foundations will give you a smooth, light finish without the risk of looking overdone. Another option to ensure your color is exactly matched for you is to have your foundation custom blended for you. wendycityfaces offers custom blend foundation which is perfectly formulated to your specific needs at a reasonable price! 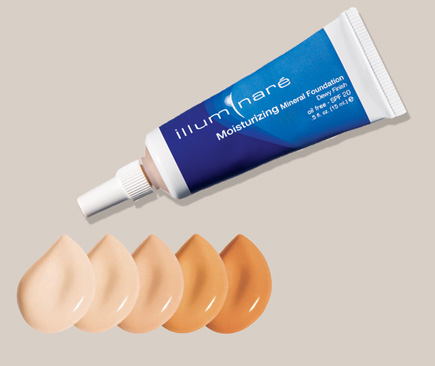 For those with chronic redness, Illuminaré is a good option for you. It is a liquid foundation with sun block. Spread thinly over the face, it provides great coverage from the elements but still covers up rosacia and breakouts. It is non-oily and is a very potent protection that stays all day. 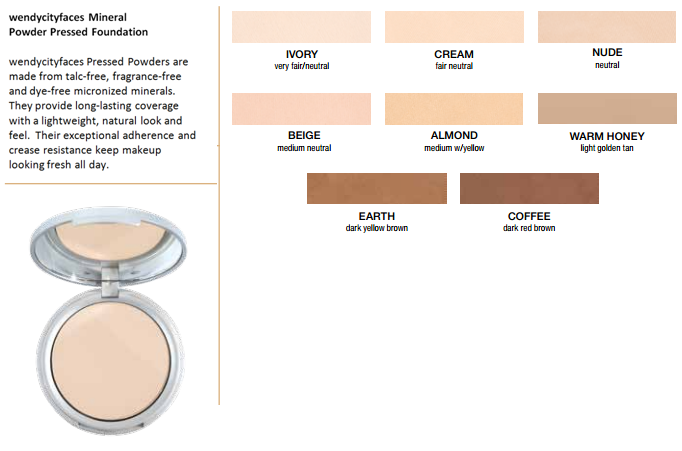 As the weather warms up, you may want to consider using wendycityfaces baked mineral foundation or Glo Minerals pressed powder base in place of your liquid foundation. 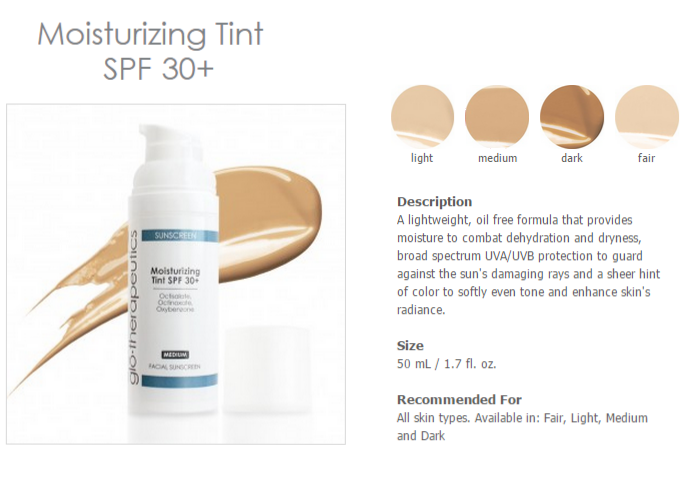 It is excellent over a sun block for nice, light even coverage. They are both excellent over a pure sun block, or on top of the Glo Minerals Tinted Moisturizing SPF 30. Your liquid foundations can be applied with a foundation brush or with your fingers. Applied Start by applying under your eyes and moving across the cheek and down the face. I encourage you to next use your concealer over your foundation (despite popular belief that it should go on in the opposite order). Follow this by setting the whole look with high definition powder for all day staying power. Whether you’ve worn foundation all your life, or you are just exploring its uses now, don’t go it alone! I’d love to help you find your best fit foundation in my Aurora studio. Contact me today to set up your appointment!